Bracelets, necklaces, earrings, pendants, diamonds, gemstones, etc. For me the answer is very simple. When we get a jewelry, each piece becomes part of our life and tells a story as pieces are bought, collected and given to us as gifts. Women ... we love to collect beautiful things, because little sparkles make us look classy. Plus, when a man buys it for us we feel special. A nice piece of jewelry from my boyfriend makes me feel valued, special and cared for. Another reason why I like jewelry is, because it is very feminine and I'm sure many woman like to embrace their femininity. The best part is that they come in so many colors, styles, plus each piece is different and unique. It's like wearing a piece of art. And of course the right jewelry can pull an outfit together and add a glamorous touch to our outfits. Have fun this summer, add a glamorous touch to your outfit with the kind of jewelry that will make you instantly stand out in the crowd. Wear it as a reminder of special occasion or use it as a way to express yourself. Hi Lilli, thank you so much. You can only imagine how much I love jewelry!!! I did go thru my box on Sunday... it felt like shopping... Can't wait for summer to get bejeweled! Hi Keany, yes, summer is the best time for jewelry. Lots of bracelets calls for bare wrists. They're all about adding that extra oomph, plus they add a glamorous touch to our outfits. Looking hot Dusi!!! Put some more pics on!!! great post! third pic is my favorite! Thank you Carmen, I'm glad you like it. Nice post, I'm following you too on bloglovin'..thanks! Thank you Nico for following me on bloglovin. Hi Marina, thank you for your lovely comment. This is so true! Each necklace or ring that I have has a story behind it, I remember where and when I got it. Thanks for helping showing some great perspective. Have a great summer too. Follow back? I love jewelry because it always fits, no matter how many pounds I gain or lose. Plus it does make an outfit look pulled together. The memories are another bonus. Jewelry wins the trifecta! Nice post!!! i love the jewelry!!! Great pictures, you look lovely. I agree with you, jewelry is very important, it give that special glamour to our outfit. Big greatings! I agree with you:) nice blog! I agree with your thoughts about jewelery. Sometimes they can really just complete an outfit. I'm really loving charm bracelets and necklaces at the moment like Thomas Sabo - they are not statement jewelery pieces but I love them! I love colorful jewelry! They make me feel like summer is coming! Thanks for stopping by my blog and for your kind comment! Have a nice evening! Kisses from Greece! Personally, I wear jewelry because it's shiny and I like shiny things. But to each their own! 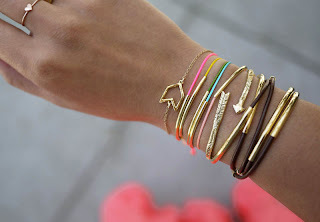 Lovely blog and I am addicted to accessories too ! I have more than 22 rings , 20 necklaces , 8 of which are statements and countless bracelets ! I THINK I NEED THERAPY ! Nice post and I like BCBG brand too. They have to many amazing hings. Have a nice friday. jewelry is always be my fav! <3 nice post~! Thank you for all of your lovely comments, likes and follows. I appreciate it! Lovely pics!!! nice summer shots! Thanks for the comment on my blog, I love jewellery too, I think it really completes an outfit! amazing and unique purpose!! how stylish you are! Hi, where are you following me? because via bloglovin I have 418 like I had before. Have a great weekend. Love your blog, Gorgeous photos. Thank you for stopping by my blog! Would you like to follow each other on bloglovin. condivido in pieno io li adoro! I love the pictures . The foot jewellery is awesome ! I really love jewelry for this reason I would like to visit jewelry blog. I would like to share a jewelry blog which is really nice. That's a cool idea for jewelry. Photos look really nice! Women Jewellery when worn in contrast ensures a mesmerizing classic charm to women’s personality with its shiny luster.﻿..